The kaleidoscopic lights of Tokyo and romance of Kyoto are a siren song for most travellers to Japan. Venture beyond these iconic cities, however, and a deeper experience awaits. As my partner and I explored the country, we interspersed stays in the proverbial hubs with lesser-known destinations that got us outdoors and away from the crowds. Not only did these unexpected highlights satiate our craving for a little adventure, they introduced us to the Japan of a bygone era in a way no museum ever could. Unlike the country’s star outdoor attraction, Mount Fuji (which we hear turns into hiking gridlock with thick throngs of tourists even in off season) these alternatives gave us an authentic taste of local life, past and present. From an ancient pilgrimage route through misty, emerald-green mountains, to a sake-fuelled bicycle ride on Edo-period streets, the Japan that lies beyond the city circuit is a haiku verse come to life. The Kumano Kodo is a network of 11th-century pilgrimage trails in the Kii Peninsula that feels more like J.R.R. Tolkien’s fantastical Middle-earth than Japanese countryside. 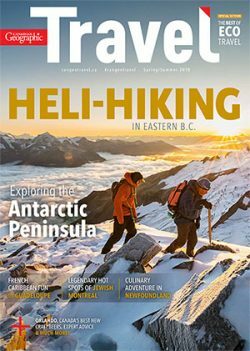 One of only two such routes in the world to be designated a UNESCO World Heritage Site, the 70 kilometres of dense, dark old growth forest and lichen-covered stones is cloaked in fog and punctuated by tumbling waterfalls. High peaks offer sprawling views of tea terraces, towering cedars, and distant parcels of green and gold farmland. The route carves through the undulating Kii Mountain Range, about five hours southwest of Tokyo by bullet train. Vermilion gates, called torii, mark countless small Oji Shinto shrines along the way, in addition to the three grand shrines of Kumano Hongu, Hayatama and Nachi. Collectively referred to as the Kumano Sanzan, these three shrines marked the pinnacle of the pilgrimage for imperial devotees who made the trek a thousand years ago. Oji shrines are dedicated to the Kumano deities said to protect pilgrims on their journey, and offer a brief lesson in Shintoism, Japan’s indigenous animist religion. 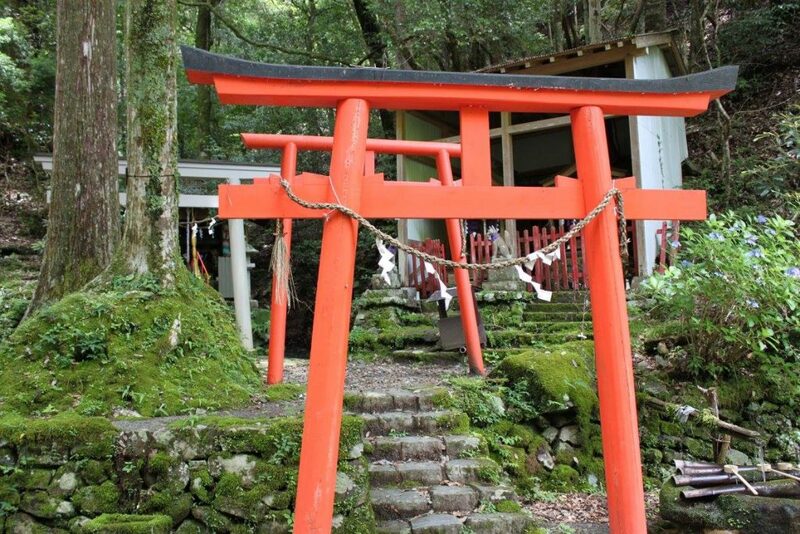 After passing through the torii, hikers wash their hands at the temizuya (a small water basin with ladles,) and then proceed to ring the shrine’s bell to greet the deity. The deep reverberations of a giant gong and perfume of sandalwood incense drift through the trees, leading the way to the larger shrines. On most treks, a weary, half-hearted effort to pitch a tent and slurp down freeze-dried food is the only reward at the end of the day, but not on the Kumano Kodo. Hikers can plot their course so that after a long day of walking, they can retreat to one of the traditional inns, called ryokans, that dot the countryside, where they can rest their tired feet in the healing waters of a hot, steamy onsen (natural hot spring bath) and feast on local fare. Irorian Minshuku and Yoshinoya Ryokan are two such inns offering comfortable accommodations. 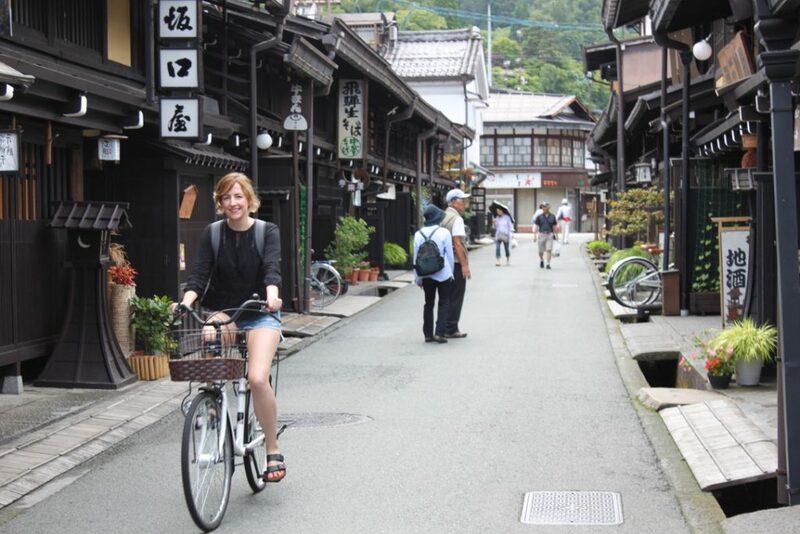 After the dizzying rush of Tokyo, visiting Takayama feels like a long exhale. 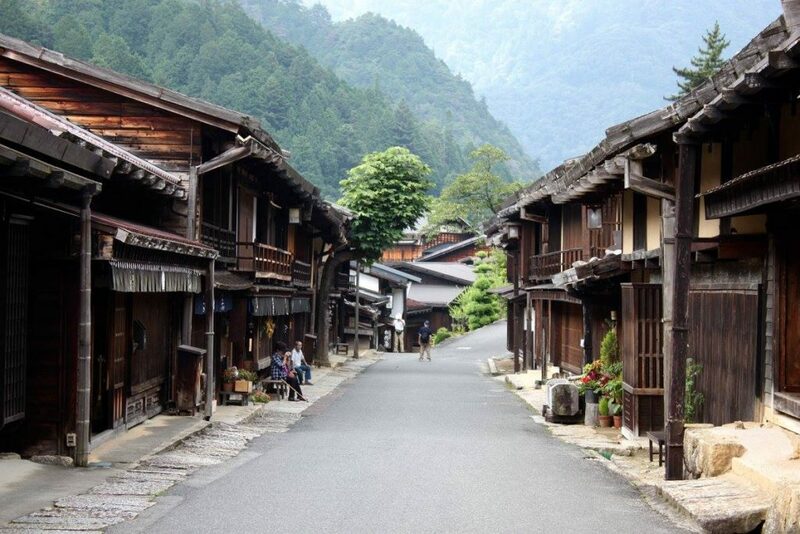 Cradled at the foot of the Northern Japan Alps, the small mountainside town gives travellers a glimpse of history they can see, feel, and taste. Postcard streets dotted with Edo-period houses are flanked by canals, and rolling hills await just outside the town centre, begging to be explored by bike. The hosts at Auberge Hida No Mori, a tranquil bed and breakfast shrouded by forest, can hook travellers up with bicycles and a map from a shop near the train station. From there, it’s a 10-minute ride north to Sanmachi Suji, a grid of historic merchant streets that still maintain a bustling trade. Look out for large suspended cedar balls, called sugidam, marking the doorways of centuries-old sake breweries—Sanmachi Suji has them in spades—and stop in for a free tasting. Before hopping back on your bike, drop by one of the area’s take-away restaurants and pick up a piping hot steamed bun filled with black sesame paste or a buttery, melt-in-your-mouth skewer of the Hida beef for which the region is famous. Southwest of the Takayama city centre is the Hida Folk Village, easily reached by a 30-minute ride through a pastoral landscape of rice paddies divided by tributaries of the Miyagawa River. The folk village, or Hida no-Sato, is a network of traditional, thatched-roof farmhouses in the Gassho-zukuri style—named for the roof’s resemblance to two hands in prayer—that gives visitors a feel for rural life in the 17th century. Most homes are two to three stories high, and the upper levels are used for sericulture, or silk farming. If you’re going to spring for a souvenir, pump your brakes at Koito Pottery on the way back into town. The multigenerational family business crafts artisanal ceramics from local clay using the unique Takayama Irabo glaze. A second day can be spent cycling to some of the historic houses and temples outside Sanmachi Suji, like the Edo-era government house Takayama Jinya, the Nara-Period triple pagoda temple Hida Kokubunji, or the Yoshijima Heritage House. Compared to the Kumano Kodo, the Kiso-ji, a portion of the Nakasendo Trail from Magome to Tsumago, is more of a leisurely walk than a hike. However, for those who consider huffing and puffing up a steep incline the furthest thing from a vacation, or for families travelling with small children, it offers just the right amount of activity. The trail, which meanders through the Kiso Valley, was used as a trade route between modern-day Tokyo and Kyoto in the 17th century, and still retains much of its historic charm. Begin your journey back to a time of geishas and feudal lords by settling in at one of Magome’s Edo-style ryokans for the night. Tajimaya Minshuku serves a spread of fresh local fish, rice, and pickled vegetables for dinner and invites visitors to linger around the irori (hearth) with a glass of sake after their meal and watch a traditional dance. In the morning, tread in the footsteps of ancient Samurai as you head uphill past the tourist information centre. Opt for the baggage forwarding service there if you don’t have a backpack. Continue to follow the stone-flagged path until you reach Magome-tōge, the highest point of the trail, which is marked by an old teahouse and a stone monument engraved with a haiku by the revered poet Masaoka Shiki. From there, forge ahead into the woods; the trail alternates between high vistas of leafy mountains and dips into tiny villages you can be certain most people who travel to Japan never get to see. Three hours and several Shinto shrines later, you will arrive at Tsumago, where fairytale-like wooden row houses wave their original 17th-century shutters, screens, and lanterns in greeting. Refuel with gohei-mochi (balls of rice covered in a sweet nut sauce) from Yamagiri at the north end of the village and then continue along that path for another 10 minutes. You’ll arrive at the former site of Tsumago castle, where you can savour a bird’s-eye view of the Edo-period town.